In need of some woodwork? Chances are you’ll want to hire a Barrington, IL carpenter. Carpenters work with all types of wood and can specialize in many different areas, including framing, finishing and custom-made furniture. Make sure you choose the right Barrington carpenter for your job by asking plenty of questions, viewing their past work and reading reviews. Rafal home improvement will complete your project on-time and on-budget. Rafal home improvement is a local and run company with over 10 years of experience. I strongly believe in developing relationships with our clients in order to completely understand and meet their painting and carpentry needs. Rafal Home Improvement offering general remodeling services to both residential and commercial clients. With our years of experience, we provide professional and reliable contracting services for a variety of work types. Our trained and certified specialists are here to provide quality job, maintenance, and repair service you can trust. As the area’s remodeling expert, Our team will manage the project from beginning to end in a safe with our wide array of construction and design services, neat and timely manner with minimum disruption to your life style. We are fully insured. Rafal home improvement takes great pride in offering you better service and quality than you expect! I love solving problems on your home. 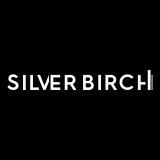 Silver Birch, is a woodworking company who specializes in Custom Kitchen Cabinetry Design, Manufacturing and Installation. Nistler Carpentry has specialized in commercial and residential rough framing and trim carpentry since 1994. Our expert craftsmanship, work ethic, and honesty has made us a leader in the North Shore and Chicagoland area. Relentless Carpentry Inc. is an experienced woodworking shop specializing in providing discerning Chicagoland clients with exceptional customer service and quality finish carpentry solutions. Here at Relentless Carpentry, Inc., we sustain our business on quality and integrity. We are experts in our trade and our commitment to quality shows from beginning to end of your project. We look forward to earning your business. We are a residential carpentry expert, specializing in custom stair design, staircase installation and stair restoration services, built-ins and cabinets, hardwood floor installation and dustless finishing, custom artwork on wood. We are experienced fabricators of custom newel posts, wood treads, balusters and railings tailored to your needs and can also work with off-the-shelf parts, including hardwood treads, cast iron balusters and wood railings. Our skillful execution and your intelligent direction result in quality-made projects and pieces that will be timeless and unique. Craiger Custom Design is a Designer and Builder of Unique Built Custom Landscape Amenities. Founded in 1989 by Master Designer and Builder Craig Harthan, we are a full service Design/Build carpentry company handling every step from Design to Completion. We are also a member of the Landscape Design Association and have an A+ Rating with the Better Business Bureau! At Jay Dawes Construction we are proud American Craftsmen! We boast honesty and top quality work. Trained by masters to perform big and small projects to the best of our ability. We are a one of a kind business and pride ourselves in our attention to detail. Expect us to show up on time and finish in time. We make sure to keep every project space safe, and clean, constantly striving for technical perfection! 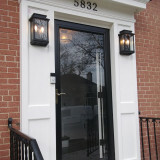 We won't just fix your home, we will enhance it! 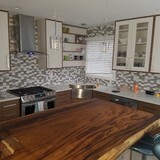 Kitchen and Bath Remodeling contractor. Trim and custom trim work contractor. Edgewater Woodwork is the carpentry of Bill Cigliano. 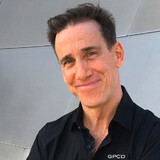 A former illustrator and graphic artist Bill brings a strong aesthetic background to the pieces he designs and builds, whether a backyard deck, pergolas, fine interior furniture, built-ins, mantels and cabinetry. Midwest Trimworks is a custom woodworking company that provides high quality craftsmanship for new construction and residential remodeling throughout the Chicagoland area. We pride ourselves on our innovative design approach and exceptional customer service. Our team of highly skilled craftsman will complete your project on time and on budget guaranteed! We look forward to working with you on your next project. Over the years, Assembly Squad has designed, assembled and installed hundred of IKEA kitchens. Our installers are skilled craftsman who implement specialized techniques for the specific assembly and installation of frame less,Ikea cabinetry including IKEA kitchen, wardrobes and closet. Who we are A group of independent contractors, with a variety of skills and diverse backgrounds, who put the client first. Working individually and in teams, we have been able to earn more top ratings from our clients than any of our competition. We take complaints very seriously as well, and while no organization can please everybody, we are forthrightly and positively responsive to every legitimate issue. This isn't easy in this business and in the Brave New World of online reputation building, where trolls and other cyber-mischief makers lurk, but our reputation rests on a simple premise – we may be as good as our past reviews suggest, but we are truly only as good as our next one, what we deliver today. Dignan Total Home is one of the most established and reliable company in the South Suburbs of Chicago, building Homes & Townhomes in the following communities of Darien, Woodridge, Willowbrook, Orland Park, Lemont, Homer Glen and Lockport since 1988, our office is in Orland Park. We have provided quality design/built Homes and remodeling / renovation services for over 28 years. P J Carpentry was founded 12 years ago. We offer high quality,finest and responsible work in finish carpentry and more. Our goal is customer satisfaction.